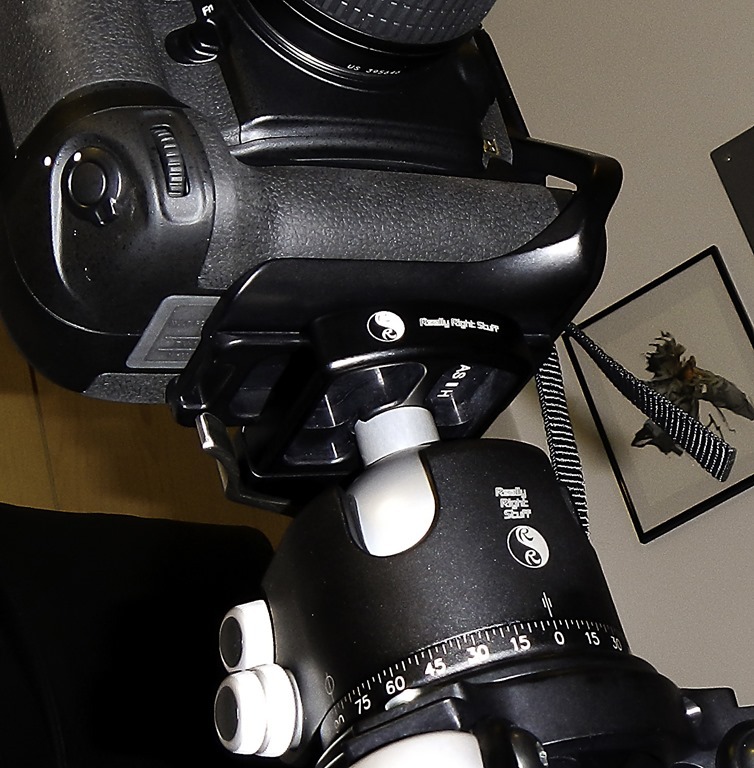 Headquartered in San Luis Obispo, California, Really Right Stuff (RRS) has been bringing top quality gear to the photography world for over two decades. 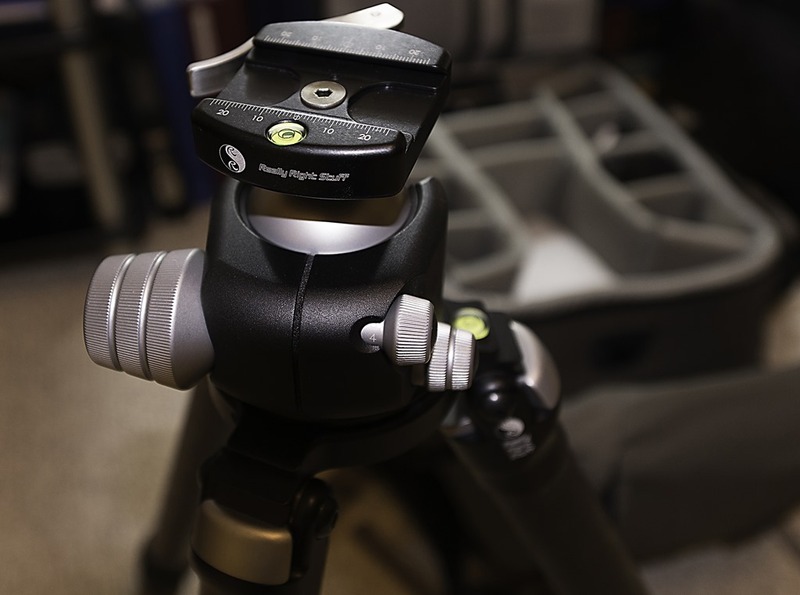 Originally formed with the singular mission of building the best quick release plate available, Really Right Stuff has taken what they have learned over the years and currently offer some of the best camera support solutions that money can buy. Their extensive list of products includes quick release clamps, camera L-plates, lens plates, Safari gear, ballheads, mobile cases, mobile clamps, mobile mounts, and, of course, tripods. Designed, manufactured, and shipped from the USA, Really Right Stuff has demonstrated a steadfast devotion to quality and top-shelf innovation and that ethos is readily apparent even with the most cursory of examinations of their products. I always begin my searches with a bit of prowling around, usually on Facebook and, of course, the always amazing Google search engine. It’s one thing to see a beautifully created magazine advertisement proclaiming the amazingness of a product but it’s quite another to read the thoughts of others who are actually using the product—if the interwebs are good for anything, they are good for the sort of truth that anonymity can bring! But care is in order as there is always an element of noise to be found on the webs, one disgruntled customer does not, necessarily, represent the entirety of a companies product line, or service, therefore it is always wise to shake a bit of salt around. Also wise is to take a look at what other photographers are using and that is usually what the second phase of my prowling around involves, what are real life photographers using, and why are they using it? 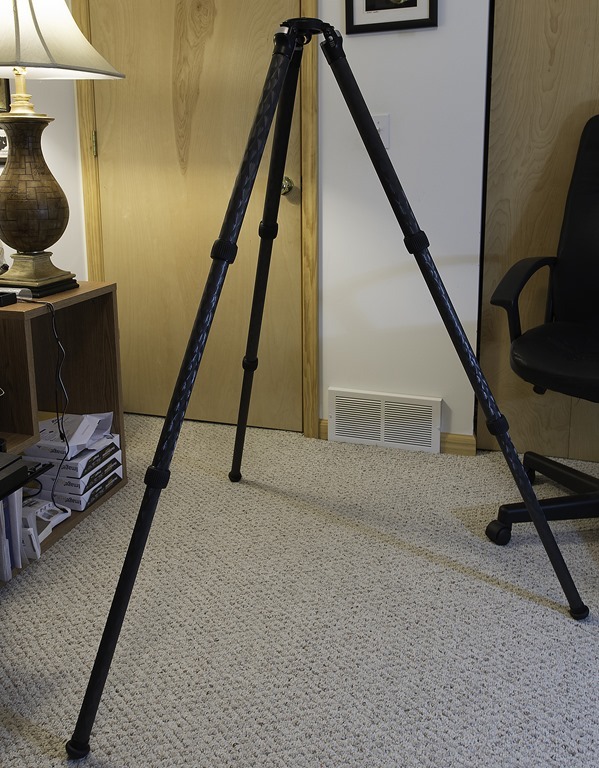 Having narrowed the choices down somewhat, I noticed that one of my favorite photographers, John McCormick of Michigan Nut Photography, had recently purchased the Induro Alloy AT Series AT413, an aluminum tripod with some impressive specifications. John is no stranger to photography or photography gear and it didn’t take me long before I had one of the 413’s in my living room. Large, built like a Sherman tank, and stable as a rock, the Induro was more than impressive and the price was right—tipping the monetary scale at just over 200.00 USD, it easily fit into the budget. Now, some of you may be saying “Hey, bub, wait a minute, two hundred bucks?? That sounds a bit cheap…” Cheap is right—as far as price goes, but it is important to keep in mind that aluminum is significantly less expensive to work with than carbon fiber. 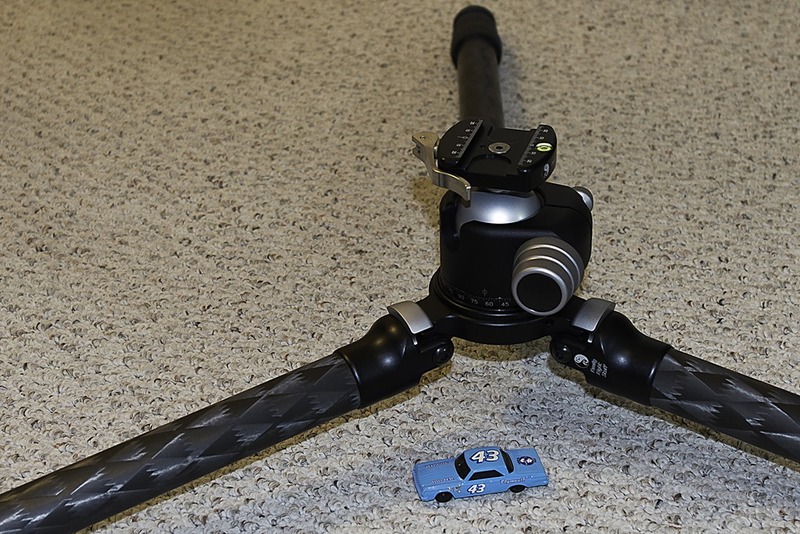 Long story short—the Induro AT 413 is easily one of the most stable and well built tripods manufactured today and I have nothing but high praise for it. Ultimately I chose to return it as that rock solid stability came at a different kind of price—weight. At just over seven pounds without the ball head, the Induro was a bit much for me to lug around given that I weigh about 98 pounds covered in ice. Seven pounds may not sound like much, but when you are hiking around the Northern Michigan countryside through multiple feet of snow or inches of friction free ice coat, every ounce counts. So, with a bit of reluctance, I packed it up and sent it back. Again, I re-iterate—the Induro was one hell of a sturdy tripod that more than got the job done. More prowling. I went to the photography world once again and noticed that another incredibly talented photographer, Elia Locardi of BlameTheMonkey.Com, was using a tripod and ball head that was on my list of possible choices. If you haven’t seen his work, do yourself a favor and check it out—truly, Elia is a world class travel and destination photographer and his work is nothing short of spectacular. In most cases, photographers at this level are in the field worrying about one thing—the image. In other words, their gear is the last thing on their minds—they know it works. And what was Elia using in the particular shot where I saw his tripod and mounting solution? A Really Right Stuff tripod and BH-55 ballhead, that’s what. My list had suddenly gotten a lot shorter and the next phase of research began, narrowing down what, exactly, I needed for the ultimate support solution that I could depend on completely while in the field. A quick look at their web page and my head was spinning—there must have been eleventy million choices and combinations and models and…and…and…make it stop! Being a man, I won’t stop and ask for driving directions—I have a GPS for that—but being a photographer I have learned that it is often necessary to practice healthy doses of humility and I figured this was a perfect time for some more practice. Listing some vital statistics—my height, and what it was exactly I needed stabilized (In camera terms! ), I fired off an email to the support staff at Really Right Stuff and before I knew it Brady and Spencer had given me all the information I needed to make the right choice for my particular camera support situation. The Really Right Choice, so to speak. Ultimately, I settled on the TVC-33S and BH-55 LR package deal which included the TVC-33S tripod, BH-55 ball head, B2-AS-II lever release plate mount, a hex head screw, several hex-key wrenches, and dust bags for both the ball head and tripod. 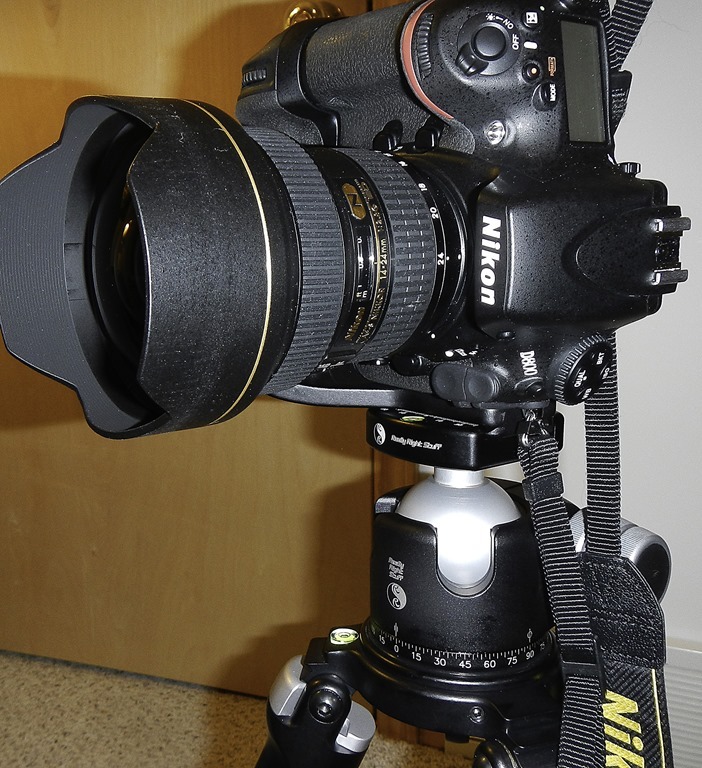 On the camera side of things, I went with the L-plate and basic plate for the Nikon D800 with the MB-D12 battery grip. 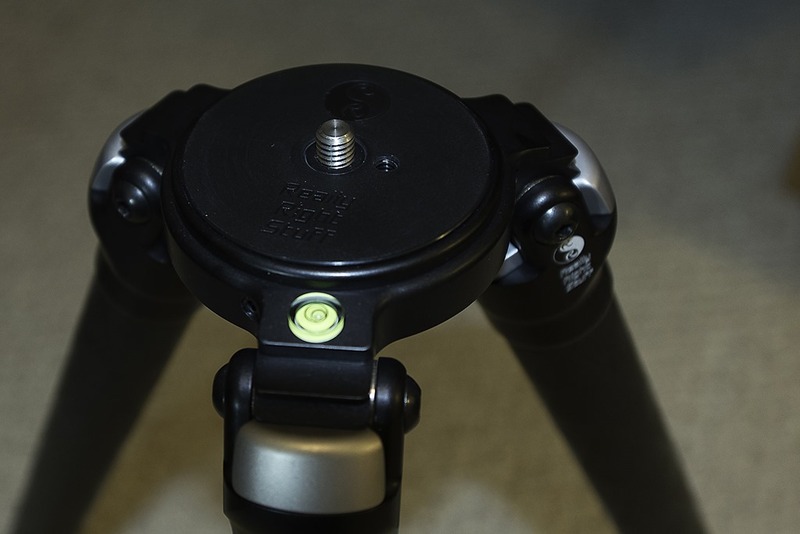 To round out the deal, I also ordered three spiked replacement feet for the tripod. Really Right Stuff offers spiked feet for shifting terrain—perfect for sand, soil, and snow—and sharper claw feet, perfect for those rocky placement situations. During the ordering phase of the operation there was a bit of drama and while I don’t mind a bit of drama now and then, when I am holding my bank card in front of a computer displaying a web page designed to take money from my bank account, well, the less drama the better. Again, practicing some of the humility I spoke of earlier, I refrained from the urge to keep pressing the ‘Process Order’ button multiple times and, instead, sent another email to Really Right Stuff. Soon after, Mike not only had the problem sorted out, he made sure that the order was properly placed and before I knew it the gear was on the way. Hats Off to the staff at Really Right Stuff, when the service is this good without a dime being exchanged, odds are the rest of the experience is going to be a good one. What the specs don’t show is another impressive aspect—how nice it all looked. The carbon fiber has a beautiful diamond pattern to it and the subdued silver and black of the tripod and control knobs makes for a very eye pleasing package. True, how it looks means nothing when it comes to how it performs, but this gear can sit in the middle of my living room any time! 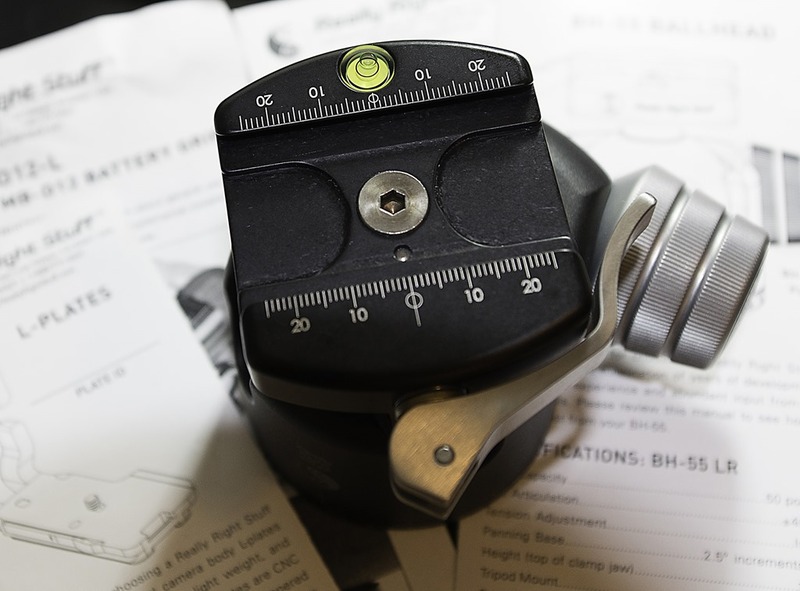 The BH-55 ballhead features three control knobs and a massive 55 mm ball. One knob controls the drag on the ball, that is, when you loosen the main lock knob to recompose the camera you can set the drag to hold the camera in place until you decide to move it, or allow it to move as soon as tension is released. Personally, I like to have one hand on the camera when the main tension is relaxed so I have the drag knob set rather light to allow for quick movement. 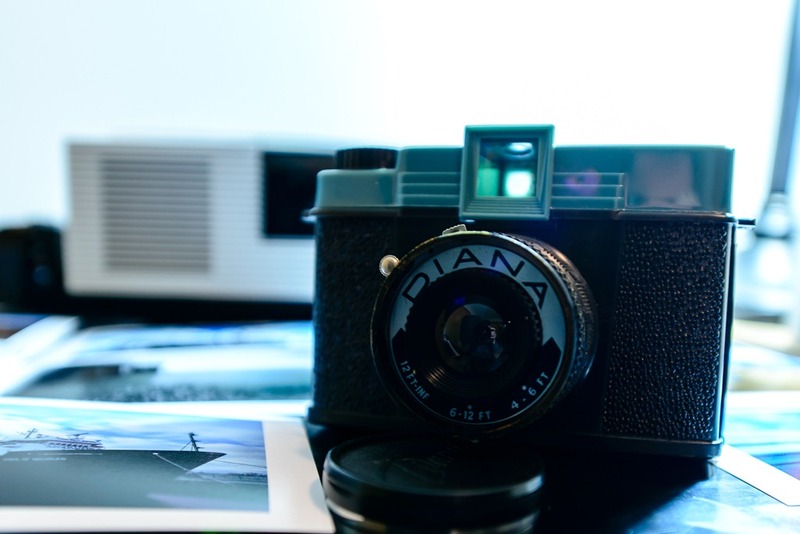 There is also a pan lock knob, adjusting this allows for a panning motion of the entire assembly, just the thing for sliding the composition in the horizontal plane without vertical movement, a handy feature for those panorama image acquisitions. 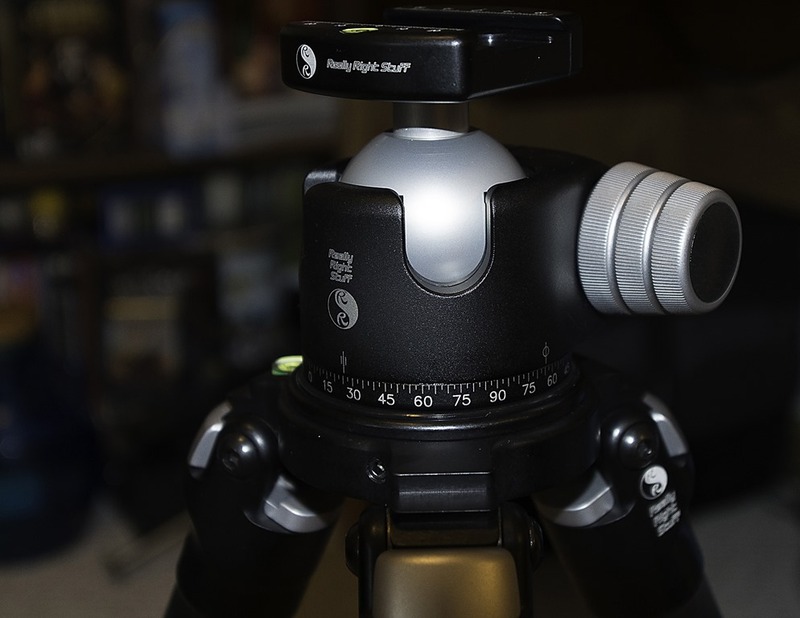 In addition, there are laser engraved degree markings on the ball head base so you can keep track of camera rotation. Dual drop notches in the head assembly, spaced 90 degrees apart from each other, allow for tilting the camera to vertical or steep upward and downward composures. The body is CNC machined and serves as both the structure and clamping mechanism of the ballhead. 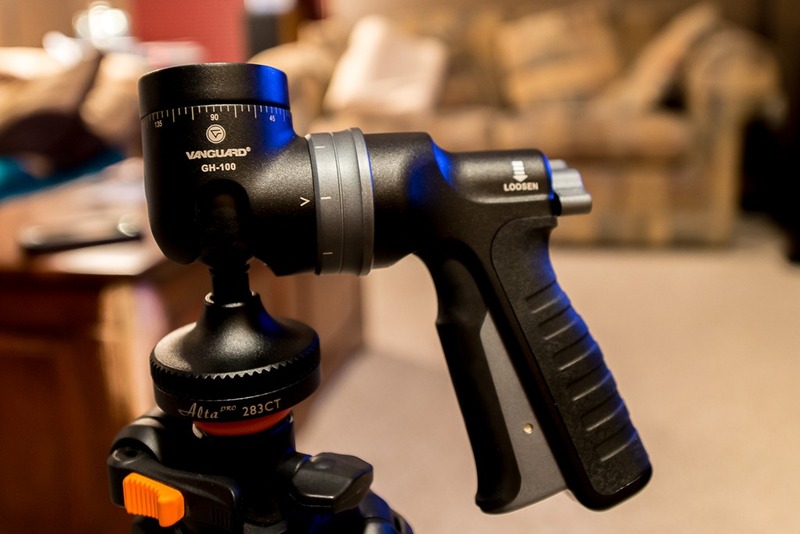 Due to the large size of the ballhead and the precise construction of the ballhead body, it doesn’t take much effort of the main lock knob to set the camera to a non-moving state. And by non-moving, I mean non-moving—not so much as a millimeter of motion was detected after setting the lock knob. 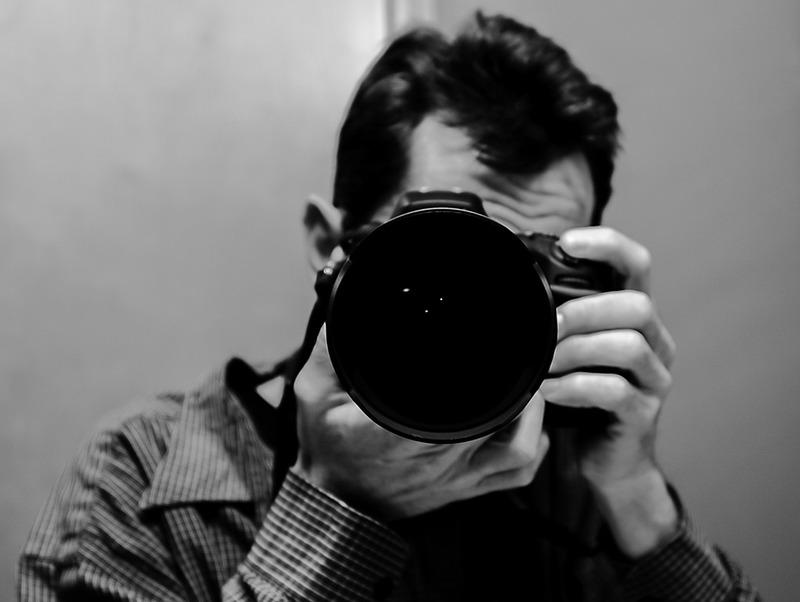 In the past, I have used ballheads of lesser quality and while they ultimately kept the camera relatively motionless, it was often the case that I would compose the shot, tighten the lock knob, and then recheck the composure as the camera would drop, noticeably, to its equilibrium position after the locking knob was set. With the Really Right Stuff mechanism, once set, it’s set. And it doesn’t take much effort to achieve this, no doubt the massive surface area of the ballhead contributes to the ultra stable situation after locking. Extremely well done and very confidence inspiring. The lever release mounting plate is also a pleasure to use. Featuring two settings, one allows you to slide the camera plate in from the side and the other fully open setting of the lever allows you to place the camera on the plate from the top. Slide the lever to the closed position and forget about it—the camera is about as secure as you could possibly want. Further testament to the outstanding craftsmanship and quality Really Right Stuff has put into their gear. Labeling the TVC-33S as ‘feature rich’ may sound a bit pretentious—hey, it’s a tripod, it’s got three legs, what’s the big deal? Normally, I would agree, if it can hold the gear without collapsing or flying away in high wind, mission accomplished. However, the TVC-33S has a couple of features that bear closer examination. First, and quite possibly the most important, it has what is known as the Suregrip ™ Apex Lock. 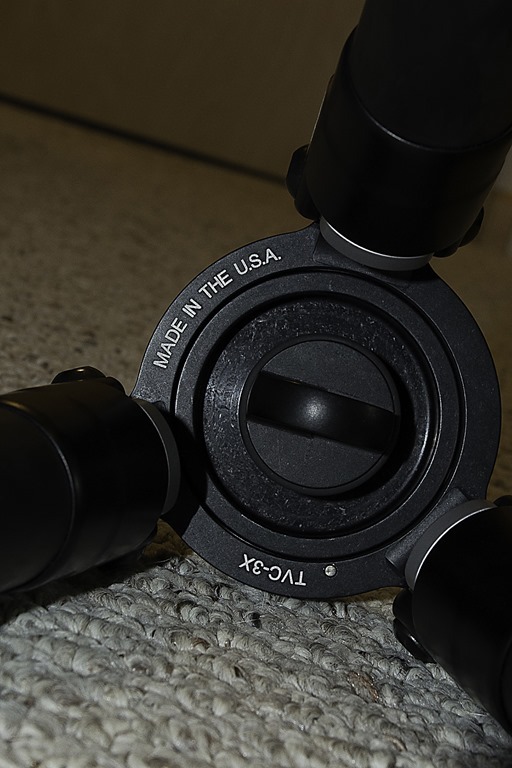 Concerning the equipment mounting area of the tripod, that is, ‘the top’, the Apex Lock is of solid aluminum construction surrounded by a stainless steel locking ring that is mechanically locked into place with three set screws. What does this mean, exactly? Well, put it this way—you can carry your tripod over your shoulder, with gear attached, and be confident that when you bring the tripod back over the shoulder to setup for the next shot…the gear will still be attached. That’s sort of important, and Really Right Stuff, through innovation and engineering, has taken an innovative step here. I certainly have carried camera’s on the tripod, over the shoulder, and have yet to have one yank out the center mount but it is not an unheard of occurrence and to see it being addressed in this manner by a manufacturer lets us know that Really Right Stuff not only cares about sales and making a profit, they care about the end user and their gear. Stuff like that will keep you in business. Once again, Hats Off. The V means Versa, and by Versa they mean that, if you wish, you can replace the top center mounting base with a mount that includes a center column or a leveling base, for example. Personally, I doubt I will find a use for a center column or leveling base as the tripod height when fully extended is right around perfect and my need of a leveling base, at this time, is non existent, but once again we see the innovation at work here in terms of future proofing the product by way of providing additional functionality should one choose it. Further neat stuff found on the TVC-33S are the offset leg joint and ratcheting angle stop construction. The offset leg joints allow for the tripod load to be distributed through the strongest points while at the same time providing for the ultimate in vibration reduction. 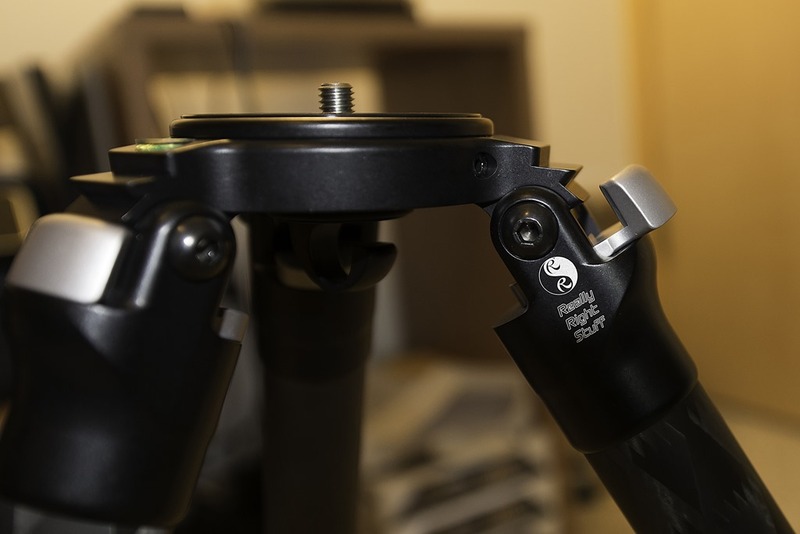 The ratcheting angle stops ensure that when the tripod legs are placed in position that they are fully seated in a quick and efficient manner. Your non-pinched fingers will thank you! Last but certainly not least…low! I really enjoy acquiring images from a low perspective and the TVC-33S, with ballhead (without center column or leveling base) gets low, real low. As some of you know, I’m a big fan of the Northern Lights and when the alarms and alerts go off more likely than not I’m in the car and on the hunt for the perfect photo op with a sky full of Northern Lights beauty. And, as luck would have it, last night was just such a night, and, as an added bonus, the sky was clear, always a good thing when looking for something beyond the clouds. I bundled up and left the house under clear skies and a bitter cold temperature in the 12 F range. But no wind to speak of. 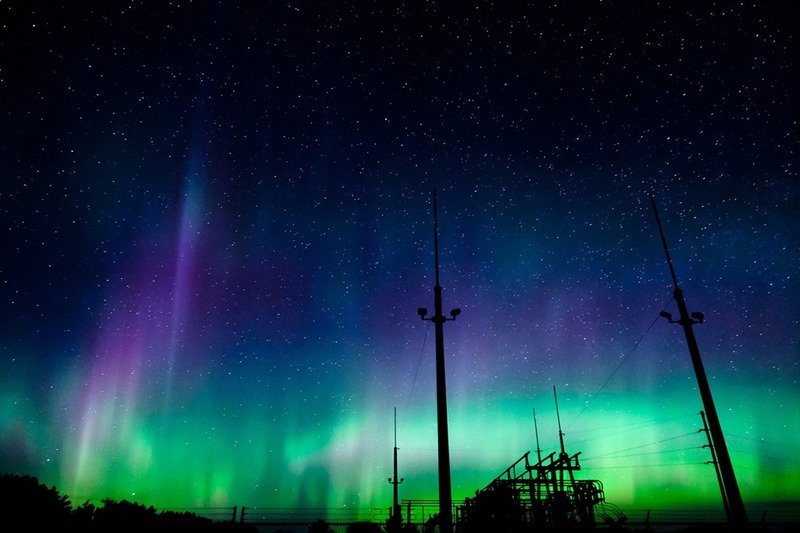 In other words, if the lights were out, conditions were perfect to see them. The moon wasn’t due up for several hours so I loaded up my trusty Subaru Impreza and made my way to one of my favorite spots along the Sleeping Bear Dunes National Lakeshore, that being Good Harbor Bay. Arriving at my destination I was a bit startled as there was some sort of howling going on outside of the car and the car was moving around a bit. Oh, I thought, that would be the wind. It picks up a bit near the big water. I didn’t have my anemometer handy but I would estimate the wind velocity at between 300 and 700 miles per hour, give or take. On the plus side, it was warmer near the lake, a pleasantly balmy 25 degrees F. With the wind chill factored in that balmy 25 no doubt would have felt more like –385 and as I listened to that wind howling, I thought to myself that it might be a good idea to write a review about how amazingly well the Really Right Stuff gear transports from site to site in the car. The very warm car. After a bit of time passed I ‘manned up’ and exited the vehicle and cautiously made my way across the iced up parking lot to the crunchy snow of the beach, facing full on a bitter wind that was fierce, and constant. I setup the tripod and just to make sure of some extra stability, I extended one of the legs at a shallower angle than the other two, putting to test the offset leg joints right off the bat. Next up was mounting the camera, and harsh wind or not it was a snap as I set it in the plate, locked the lever, and powered it up. So far so good. At this particular time, the Northern Lights were nowhere to be found so I took the opportunity to grab a few long exposure images of the bay and practice holding the camera strap in the gale force winds without tipping everything over. I changed the composition a few times, made easy by the large main lock knob and once locked it was locked—just like in the comfort of the living room, the frigid cold had no effect on performance. It wasn’t long and I had had enough. I couldn’t feel my fingers or my face and I carefully made my way back to the car to warm up and then head back home, extremely satisfied with the support gear but not impressed at all with my will (or lack of it!) to endure the frigid cold. In the comfort of the warming car, I took a few quick and dirty handheld shots and, sure enough, saw hints of the Northern Lights on the LCD display and, perhaps a bit reluctantly, left the comfort of the car once again. I decided to stay off the beach this time in hopes of just a bit of relief from the harsh winds but that meant I had to setup the gear on the iced over parking lot. First things first, I setup the tripod then came back to the car for the camera, mounted it, and began taking more exposures. I have to be honest, I was a bit worried that the wind was going to play havoc with the tripod on the ice—I hadn’t installed the spiked feet yet—but I was able to find a relatively stable location but it was still slick. I had nothing to worry about, the only thing moving out there was me as I carefully grabbed the camera strap during each exposure to help eliminate any vibration induced blurriness by the action of the wind on the strap. The lights were there, but barely. Low on the horizon and not strong as far as intensity was concerned, I nevertheless quickly stopped worrying about two things—my gear, and my gear falling to the ground in a mass of collapsed tripod assembly. The Really Right Stuff really was the right stuff. Finally, I packed the gear and sat in the car for awhile until I got enough feeling in my hands to enable safe driving and made the twenty mile drive back to headquarters, extremely satisfied and confident that my latest gear purchase was the right one. In closing, I strongly and highly recommend the offerings of Really Right Stuff. Customer service, innovation, construction, quality, and, most importantly, performance and ease of use in the field far and above expectations lead me to one conclusion—Really Right Stuff deserves to be included on any ‘must have’ photography gear list one may choose to compile. The author wishes to thank Brady, Spencer, Mike, and the rest of the fine folks at Really Right Stuff for their immediate, thorough, and complete customer service—well done, it’s nice to see that sort of thing is still around. I’ve said it before and I’ll say it again—Spring is right around the corner…and winter is right around the other three. The past two winters have been relatively tame around these parts, so tame in fact that I had forgotten what four foot high piles of snow on either side of the driveway look like. This past weekend was a perfect example that the snow machine is in perfect working order as around ten inches of new snow joined the previous seventy five feet of snow we already had. Ok, I am exaggerating a bit as it is more like a hundred feet of snow! I gave myself a few goals for this coming year and so far so good. One of those goals involved a re-examination of my photographic endeavors of the previous year and that goal was to stop going to a location and taking six million photographs of, basically, the same thing. True, in this day and age of digital photography the film is free but I soon discovered that I was becoming good at one thing and one thing only—pressing the shutter button. I wasn’t seeing the beauty around me, I wasn’t appreciating the beauty around me, I wasn’t capturing the beauty around me, I was standing on a beach or hill at sunset, testing the lifetime of batteries and storage capacity of memory cards. Sure, I might catch a good one here and there, but the fact remained that when I got home and transferred the photographs to the computer for processing I increased my skill in yet another area—hitting the delete button as shot after shot after shot fell far short of anything I was prepared to put my name to. Discouraged but not ready to give up I took a suggestion offered by a world class landscape photographer and stopped filling the memory card with redundancy. It’s amazing how much better your photography becomes when you start treating those memory cards like rolls of film and that is exactly what I vowed to do. My current camera memory configuration allows for the capture of around 1200 images before it’s time to pull the cards and that, to put it bluntly, is a bit on the excessive side. Hence the new goal—stop taking so many damn pictures and start taking a few good ones. Mission accomplished—on average, the shutter on my camera now snaps open and shut about 90% less than it used to and it has made all the difference. Granted, I haven’t magically become a world famous photographer or even the most famous photographer of the street I live on, but the results speak for themselves. Sometimes, when we ask for a bit less we end up with a lot more. 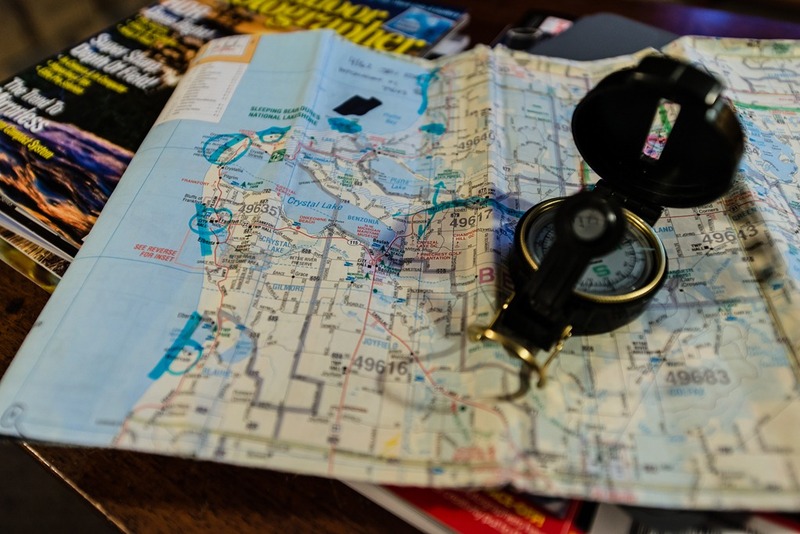 I spend more time researching and planning what, exactly, it is that I am going to do at the location I am planning on visiting and even find room to toss in a few contingency plans in case things don’t go according to my wishes—a common occurrence. Given the amount of snow we have had this winter, that contingency might involve looking for a new angle on the mailbox at the end of the driveway if I were to get stuck short of my destination…for example. Another goal I set for myself is directly related to the first and that is to obtain around one portfolio worthy image per month. One. Per month. For the Portfolio. I have fully embraced the ‘quality not quantity’ mindset and, to my surprise, less has become more. No doubt there are billions of photographers out there who can take a hundred photographs per day and all will be Facebook post-worthy or fast-tracked to the Louvre, but I am not that guy. In fact, I don’t think I will ever be that guy. It wasn’t easy to make this change, in fact, it has taken months and still feels a bit alien to me but beneath that feeling of discomfort that comes from change is another feeling, a feeling of great satisfaction that doing something outside of my comfort zone has led to results far beyond what I was achieving doing the same old same old. Time to retire? Not likely! One of the beautiful things about photography is that you are always learning and if you are willing to take an honest and open minded look at your work, those changes might be for the better. I have a lifetime of learning to go and I can’t wait for the next step in this journey. My final goal has been one surrounded by some difficulty—finding wall space. Don’t get me wrong, I’m not doing this for the money—I would have starved years ago—but I do desire to have real life examples of my work, at the very least, enjoyed by others and that involves wall space that isn’t my living room. As luck would have it I was recently contacted by Mark O’Shaughnessy from the Traverse City Art & Design Studio and soon after our first meeting I found myself in possession of one of the rare luxuries in the art world—wall space. 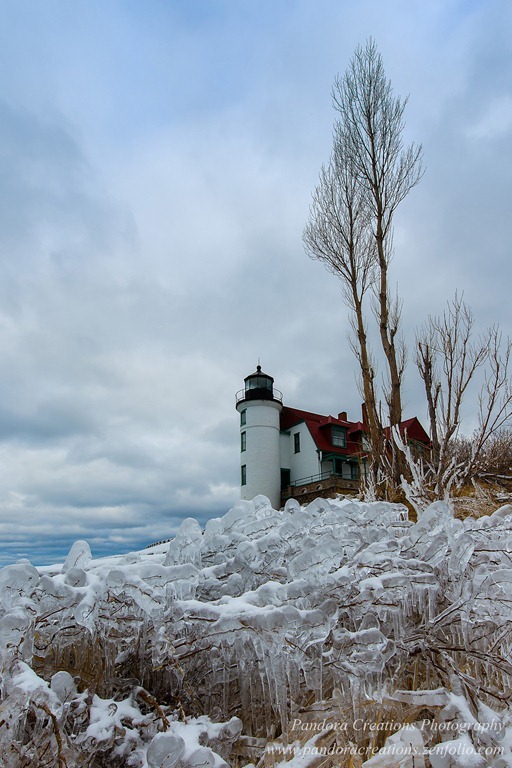 ‘Point Betsie Lighthouse’ Crystallia, Michigan. Once again I am leaving a comfort zone and, once again, I get the feeling that the time is right for another step on this journey. For this particular display I have chosen two photographs from the past few months of work, Barnstorm, taken on a gorgeous sun filled February day near Empire, Michigan, and Point Betsie Lighthouse, a personal favorite from beautiful Crystallia, Michigan, on an icy cold day at the end of December, an area that is well known to Northern Michiganders and a favorite with many photographers. Todd and the rest of the crew at McMillen’s Custom Framing have, once again, done a stellar job with the presentation and framing of the images. 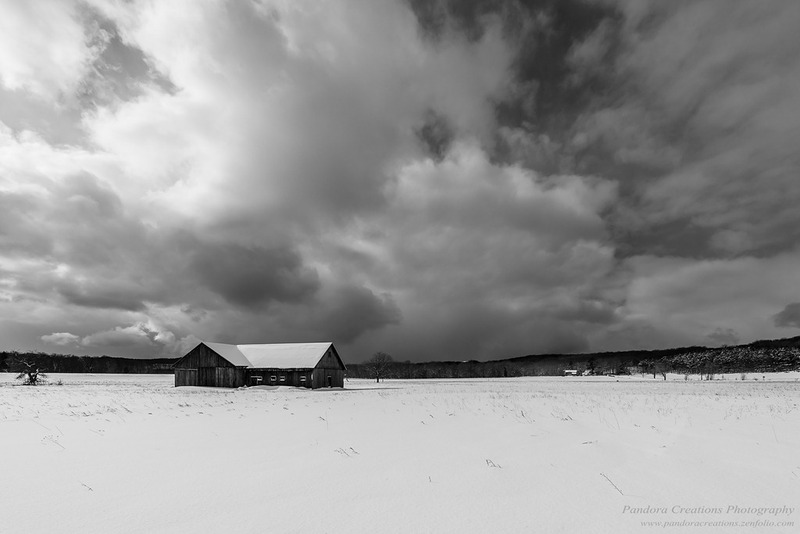 The images will be on display through March and April alongside many other fantastic photographs and original artworks from artists around the Northern Michigan area. For complete details of events, shows, and artists displaying works at the studio make sure to visit their Facebook page, Traverse City Art & Design Studio. When we let go of our dreams we must be wary of embracing the wrong side of life. Across the street from Bronson Lake. About a month ago, I found myself, once again, prowling around the Point Betsie Lighthouse area in search of the ever elusive keeper for my portfolio. Well, that isn’t entirely true—my first order of the day was testing a new filter holder system for an upcoming video review and if I got a keeper in the process, all the better. But testing is testing so I kept to the task at hand and tested. The goal for the day was to acquire at least one illustrative long exposure photograph as I was putting a 10 stop Hitech Formatt 165 mm x 165 mm rectangular filter through the paces. A 10 stop filter is an interesting beast, allowing for quite long exposure times even during the daylight hours, and, if conditions are right, the results are often dramatic. This day happened to be a great day for such a filter as the sky was filled with plenty of fast moving clouds, big waves were moving into shore in all of their turquoise glory, and the seasons first show of icicles on the break wall completed the circle, in other words, three phases of water were in co-existence, and the prospects were good. At the very least, an interesting composition presented itself, just the thing for a long exposure capture. Simple? In theory, yes, setup the tripod, set the focus, figure out the correct exposure time, trigger the shutter, capture the image, go home, get warm, have a cup of coffee. So much for theory…while setting the tripod up, it was clear that whatever timing scheme I had going was not working as more often than not at sometime during the exposure phase, a wave would just so happen to travel about twenty feet farther than the previous breaking waves and in doing so flooded the tripod feet, causing the camera to dip a few inches in the newly formed quicksand which did not lend itself well to a sharply focused shot! 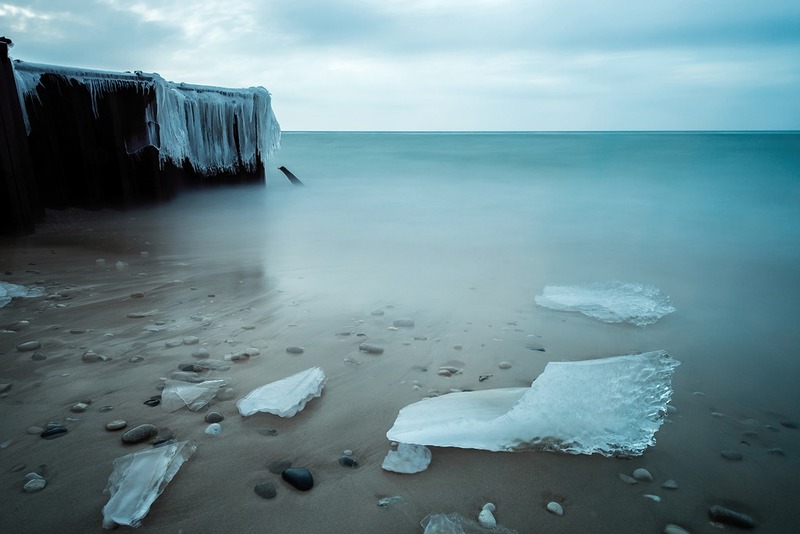 Further, the ice I was trying so desperately to capture in the image would remain in one place…until, at some time during the exposure another rogue wave would hit the shore and move it several feet in a random direction. Finally, after nearly an hour of hoping for at least a small amount of luck, I was able to capture an acceptable image, Castaway. Now, if you look closely, you can see that some of the smaller ice chunks did, in fact, move a bit during this exposure but I liked the effect of it so I went with it. In preparations for long exposures, I acquire several images without the filter in place. These are to ensure the sharpness of the stationary objects in the frame and, further, to give me some idea of the unfiltered exposure parameters which allows for the calculation of the correct exposure time with the filter in place. I like the contrast of sharpness for the stationary objects versus the smoothness of the moving elements in the photograph and extra time spent in the preparation stage of the image gives me the effect that I want—for the most part. During this phase of preparation, I’ll gather anywhere from five to twenty images at normal exposure times as during the long exposure phase you are basically standing there, hoping for the best, and in my experience, the more time you spend prepping for the final image, the better your chances of a result you are happy with. Natural events aside—moving elements in the image and waves that threaten to wash away the tripod and camera to a new location, for example, are out of the photographers control, of course, but by spending the time and being persistent, the reward is often an image to be proud of. Dramatic skies, decent size waves, a foreground element of ice that had recently broken free of the break wall, and a wave rushing toward and behind the camera location giving a sense of ‘being there’ to the viewer. 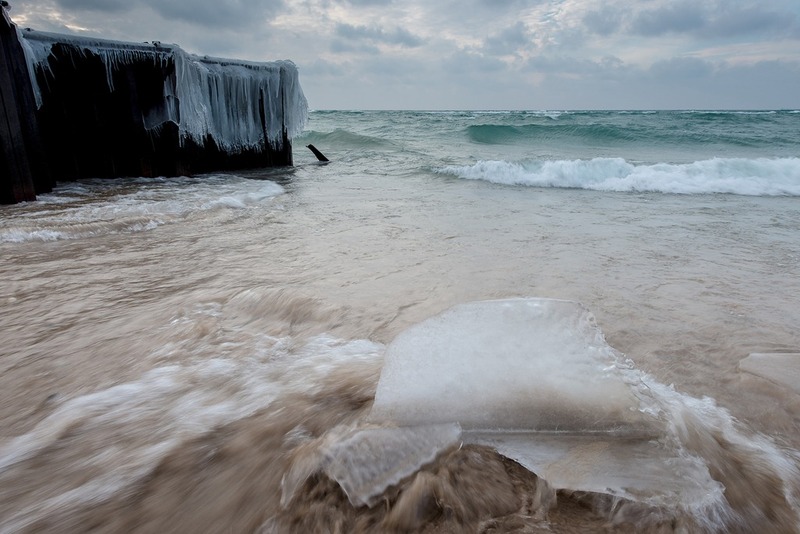 Not likely to find home on a billboard along M22 any time soon, the photograph nevertheless captured the conditions of the day as I experienced them—windy, cold, powerful, a small glimpse of the grand beauty of Lake Michigan. But on taking another look a few weeks later I realized a few things were not quite exactly how I remembered them. In fact, on further examination, I found the image sort of on the blah side of things. For one thing, I distinctly remember that the water and churning sand on the beach were more colorful, and the clouds were a bit bluer. At the time, I wasn’t paying a lot of attention as, for all intents and purposes, this image was acquired for the purpose of ensuring sharp focus and to give me an idea of the proper exposure time once the filter was in place. Of course it wasn’t perfect—only a visit with our own eyes can give that kind of experience—but it was an important example of how giving something another look can be like seeing it again, for the first time. Ah yes, the difference a year makes. A well worn cliché, to be sure, but, as with all cliché’s, it remains for a reason. In my case, the difference a year made has been significant. As many of you know, photography is a passion of mine that went from lifelong hobby to something a bit more in the fall of 2010. While I harbored no intentions—or illusions—of striking it rich in the super saturated photography market, I definitely had an agenda to bring my photography to the next level, so to speak. In other words, I made a conscious effort not to just take better pictures, but to be “better than the photographer I was the day before”, to quote an often used phrase. I think that, for the most part, I have succeeded in my endeavor to this point, but, as they say (just who are ‘they’ by the way??? ), more work is to be done. The previous year was not without some struggle, however. Near the end of 2011, as things began to really get rolling with the photography gig, I was unexpectedly and quite painfully sidelined with a back injury that, for whatever reason, took about a year to surface following a rather serious car accident. I chalk it up to ‘one of the great mysteries of life’, regardless, my photography career—and walking normally, for that matter—took an immediate back seat to my physical recovery. Slowly, and surely, the months passed and the recovery came and before I knew it I could hold a camera for more than five minutes without agonizing pain and discomfort getting in the way. Finally! Not long after, the Super Storm of March 2012 paid a visit and while removing tree limbs from my car so as to get inside of it and get warm after three days without power I…broke my damn wrist. Another great mystery of life, perhaps, or just some guy in the middle of nowhere trying to get warm. Regardless, I knew that I had six weeks of wearing a cast and about a month of rehab to look forward to once it came off ahead of me. Undaunted, I quickly learned how to adjust to the cast and in no time at all I found myself taking pictures again. Pure joy, that. Even sweeter, as luck would have it, one crisp April night I found myself in the right place at the right time for one of the most intense Aurora Borealis displays of the year. I must have been a sight to see, middle of the night, jumping up and down with glee like a small child with a new toy, trying not to bang my still healing wrist on anything important, such as, oh, the camera and tripod, for example. As they say…anything for the shot. Soon enough, the rehab was finished and it was time to get down to business, in this case, that business involved making some decisions as to which direction I wanted to go in terms of photographic genres. After some long and careful thought it was clear to me that my true love was in landscape photography. It doesn’t hurt that I live in one of the most beautiful locations in the entire country, if not the world, and honing the fine art of landscapes, I felt, could not happen in a better place. Besides, thanks to the Creative Housing Market of 2007, I wasn’t going anywhere anytime soon. Having made the decision to work on landscape photography—for the most part—I felt a sense of relief as I no longer felt that I was pressuring myself to learn every genre. On the other hand, it wasn’t long after this decision that I noticed something that troubled me. I realized that instead of capturing images I was going to locations and filling memory cards. In other words, instead of concentrating on acquiring an image worthy of a portfolio I was under the mistaken impression that more is better. Now, for some photographers, this may be the case, but, regrettably, I am not that photographer and no matter how much I would like every single image to be a show stopping keeper, the fact was that the more images I acquired, the less I liked any of them. Soon after this realization, discouragement set in, and I found myself going to new locations not because I wanted to, but because I felt that I had to. And this, in my opinion, is not the best mindset when it comes to photography, or, for that matter, anything else. We’ve all heard it said many times, “Quality, not quantity”. But we don’t always listen to that sage advice. Discouragement quickly led to a sense of loss, for lack of a better word. I thought that I had at least a little bit of talent but soon began to doubt that very much. I suppose, were I a professional athlete or race car driver, what I was feeling might be described as being in a slump. I wasn’t at the point of giving up, but I was at the point of thinking that maybe I was better off doing this as a hobby. I couldn’t accept that—my conscience wouldn’t allow it, and my passion, though tempered, was not gone altogether. In response to this uncertainty, I did what many people do in similar situations and sought outside consultation. I signed up for an hour consultation with Patrick DiFruscia, an amazing landscape photographer who I feel is one of the best in the world. The consultation went great and the honesty and knowledge expressed by Patrick was refreshing to me, a breath of fresh air, and exactly what I needed to hear. I felt rejuvenated and committed to my original goal—being better than I was the day before. I began to carefully plan not only the location of the next session, but what it was, exactly, that I wanted to obtain from that session. I knew what I didn’t want—a thousand shots of ‘blah’, I knew what I did want—the possibility of a shot of a lifetime. I was more focused and found myself taking less photographs and, to my surprise, ending up with more keepers. Not necessarily the once in a lifetime images, or even more for the portfolio, but images that filled me with excitement, renewed my passion for the craft, and encouraged me to leave comfort zones that until recently had been cast in stone. In terms of gear, 2012 brought with it a substantial change. I traded in the venerable and much loved Canon 5D Mark II for the brand new and unproven Nikon D800. The truth is, the very second the Nikon was announced, my ears perked up and I kept a very close eye on just what in the Sam Hill Nikon was up to with this one. With a stated resolution and image quality approaching that of medium format cameras, this was some serious kit. On paper. It all looks good on paper…but how does it look in reality? Slowly, the reports began to trickle out as well as some rather stunning images. Yes, the 36+ megapixel sensor made by Sony was for real and, with the right glass, image quality was astonishing, to say the least. The dynamic range was reported to be a full three stops wider than the 5D Mark II. Now, as far as a Canon vs. Nikon ‘war’, you’ll find none of that here—I’ve shot with Olympus, Sony, Kodak, Canon, and Nikon, to name a few, and in all cases have achieved excellent results. When you hear it said or read that “It’s not the camera”, you can believe it. On the other hand, I probably wouldn’t show up to the big wedding session with only a cell phone camera and some KooL-A-Gram filters, no matter who I was. Sometimes, the equipment does matter. With that being said, a great camera will not make you a great photographer; a bad camera will not make you a bad photographer. But all was not unicorns and sunshine for Nikon as some very troubling reports began to make their way to the masses soon after units began to ship. Left side focus points that were all but useless, and, even more troubling, tiny white dots all over the image when long exposures were acquired. 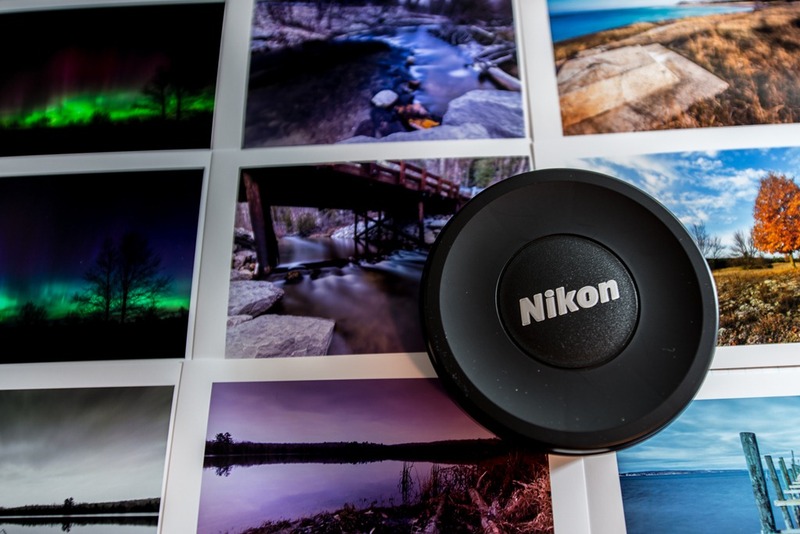 Given that the Nikon D800 and D800E were new beasts, I did not find these reports surprising. In the case of the bad focus point (not all cameras suffered from this), unfortunately, the camera had to be sent back to Nikon for focus point recalibration, in the other case the user was all but forced to enable the Long Exposure Noise Reduction function to deal with spots on the image for long exposures, effectively doubling the time required to acquire a long exposure image, and, possibly, preventing one from a second try at that perfect lighting. And there was something else…oh yeah—I couldn’t afford it. But that all changed in October when I walked into the local Camera Shop and was offered a tremendous trade in offer for my 5D Mark II, lenses, and gear. I made the switch and never looked back. I won’t go into the details as I am trying very hard to keep this first—and longest—blog entry of the year of reasonable word count, but suffice it to say that I was pleasantly surprised and extremely happy with my decision. 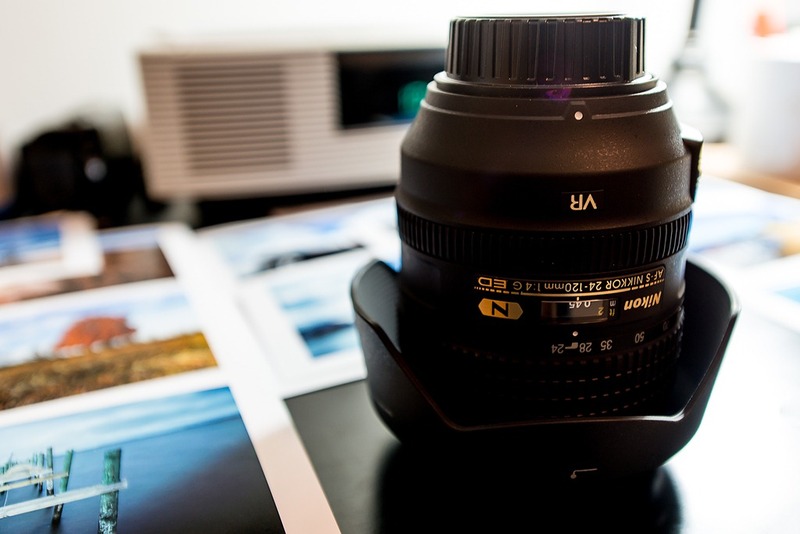 Does the D800 make me a better photographer? Nope, not a bit—but the expanded dynamic range, low light, and high ISO performance improvements give me tools that I did not have before and welcome whole heartedly. At the end of the day it was a personal choice and it doesn’t change my opinion that the Canon 5D Mark II is one of the greatest cameras ever brought to market in the history of photography. One of the most comfortable places for me to be is in front of my editing station. Ironically, I don’t like editing photographs as much as I like taking them, but that is probably a common thing. Nevertheless, if you are shooting in RAW mode exclusively, well, you’re most likely going to be editing at some point—the camera is going to give you the full, 14-bit uncompressed sensor image and you’ll get none of the in camera brightness\contrast\sharpness\saturation\color\etc. adjustments that are done automatically if shooting in JPEG mode. So…plan on a bit of sharpening, maybe an adjustment to the white balance, perhaps some contrast and saturation changes if you shoot in RAW mode. I try my best to get everything ‘right’ in camera, but it is often the case that a touchup here and there is not only a necessity, but a requirement to complete the vision. 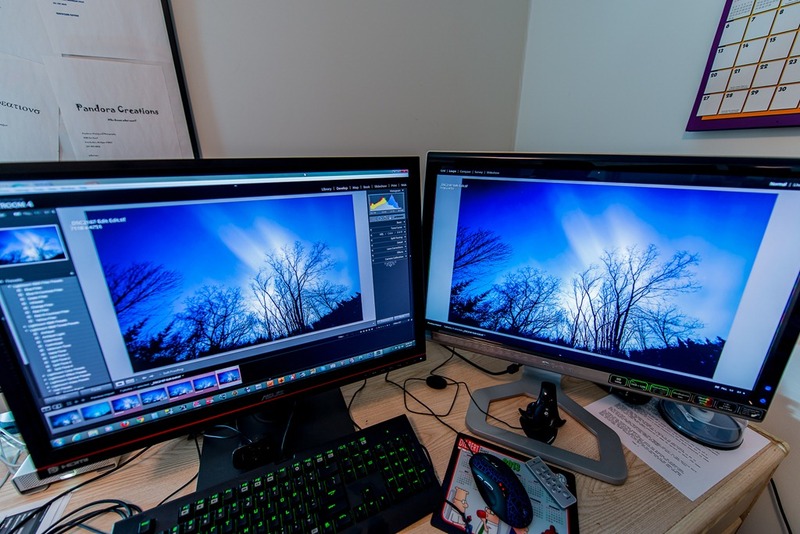 From color calibrated monitors to carefully controlled lighting conditions, the editing station is critical to the digital image development workflow and the more comfortable you are here, the better your images will be. At least I keep telling myself that. Lately, I find myself working on long exposure images using high stop neutral density filters, and I am taking small steps while tackling the beginning stages of learning the luminosity blending technique. In addition, I now have, for the first time, a piece of art hanging on a wall, for sale. Thanks to the Grand Traverse Art Bomb Show, running January through March and displayed on the walls of the Right Brain Brewery in Traverse City, Michigan. 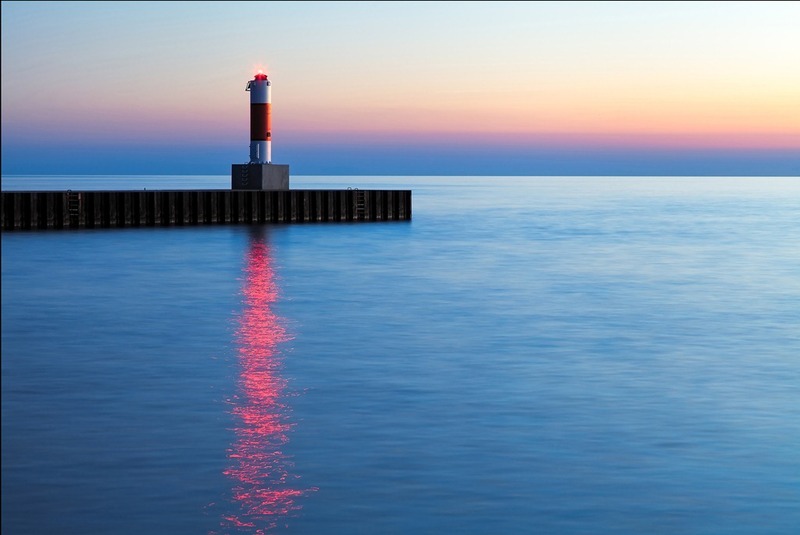 The piece is one of my favorite photographs, the southernmost beacon at Portage Point in Onekama, Michigan. If you find yourself in or near the Traverse City area, stop on by the brewery and have a look at all of the fantastic art on display. In the coming year I will be working hard to have my work on display in more local settings. To wrap this all up, neat and tidy, it goes without saying that I am very grateful and extremely appreciative of the support I have received this past couple of years from friends, family, and, last but not least, my wonderful clients. That you find enjoyment in the images I share means more to me than I can say and I look forward to sharing more with all of you as the year unfolds.